Apple generally isn't known for releasing quick statements regarding rumors about its upcoming devices, which makes its lightning-fast response to a new Bloomberg article claiming that Apple scrimped on Face ID quality to get the iPhone X out in time all the more remarkable. In an email statement to TechRadar, Apple flatly denied the truth of the report, or, at least the article's specific claim that Face ID may no longer have the "one-in-a-million" chance of failure Apple touted in its reveal presentation last month. "Bloomberg’s claim that Apple has reduced the accuracy spec for Face ID is completely false and we expect Face ID to be the new gold standard for facial authentication," an Apple spokesperson said. Again, these are strong words for a company that usually just releases the same canned statement about how it doesn't discuss rumors when these kinds of things pops up. "Customer excitement for iPhone X and Face ID has been incredible, and we can’t wait for customers to get their hands on it starting Friday, November 3," the statement continued. "Face ID is a powerful and secure authentication system that’s incredibly easy and intuitive to use. The quality and accuracy of Face ID haven’t changed. It continues to be 1 in a million probability of a random person unlocking your iPhone with Face ID." Apple's statement doesn't deny most of the claims in the article, which purports to give an insider's look into squabbles over component manufacture associated with the iPhone X from the always dubious "people familiar with the situation." 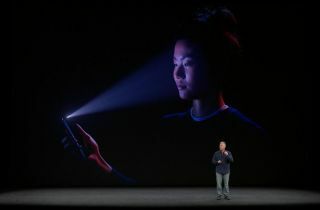 "To boost the number of usable dot projectors and accelerate production, Apple relaxed some of the specifications for Face ID, according to a different person with knowledge of the process. As a result, it took less time to test completed modules, one of the major sticking points, the person said." The report still claims that even a downgraded version of Face ID will likely to still "be far more accurate than Touch ID, where the odds of someone other than the owner of a phone being able to unlock it are one in 50,000." But Apple isn't backing down. Considering its usual silence in situations like this, it might be worth taking its reply seriously. The good news is that we now don't have long to wait before the iPhone X officially launches on November 3, and we'll be sure to tell you what we think of Face ID's accuracy in our official review. In our hands-on iPhone X review following the reveal event, we weren't able to try out the technology ourselves, but, "when it was shown to us directly the person demonstrating the phone kept having to turn the display off and on again to activate the system." Face ID also failed to work during the official presentation by Apple executive Craig Federighi, although Apple said this was due to other people handling the phone prior to the presentation. In essence, it said, Federighi's troubles were proof that Face ID was working "as it was designed to."